As disturbing as this movie is to watch I believe it has an extremely powerful message and support the courage of each individual involved in making this documentary. The cause is simple: to stop dolphin slaughtering in Taiji, Japan. Exposing this story and the people behind it was not so simple. It all started with Richard O’Brien. Back in the days of Flipper (hopefully some of you out there still remember that show) Ric worked on set as the dolphin trainer. He was actually the one, along with another colleague, who caught “Flipper” (later named Cathy) and the other understudy dolphin we’ll call Flipper #2. 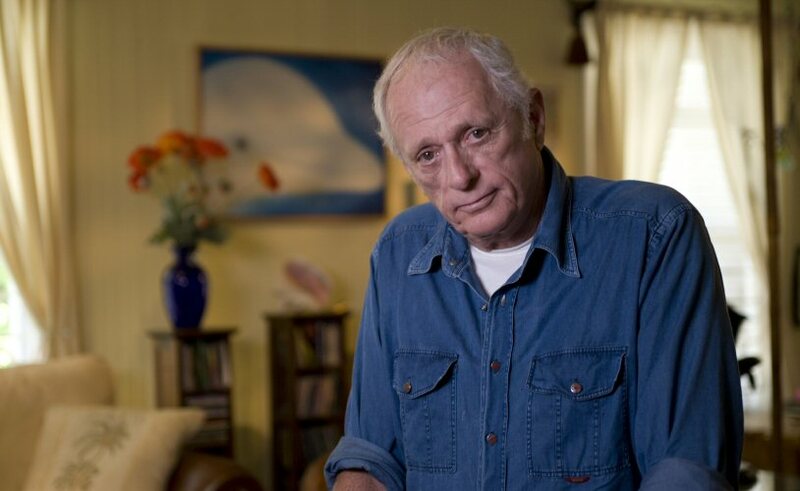 An avid animal lover Ric lived on set and spent most of his day with Cathy training and taking care of her. When the episodes would air he would run a long extension cord, bring his TV out to the dock and let Cathy watch herself on the show. He explained that dolphins are self-aware animals and that she could tell the difference between herself and Flipper #2 in different shots. I’ve always known these are exceptional and smart creatures, but I did not know they are self-aware since few mammals are. As Ric explains he “spent the first 10 years building the industry up” and then he’d “spend the next 35 trying to tear it down”. So what happened to the industry? How did it go from Flipper to slaughter? Following the success of the TV show dolphinariums and places like Sea World became wildly popular. I mean, who hasn’t seen Shamu or know someone who has? These prized animals command a pretty hefty price on the market – up to $150K per dolphin. As we all know dolphins use their very keen sonar skills to both communicate with one another and navigate through their surroundings. Well, leave it to the Japanese to outsmart us all. They devised this system of patrolling a bunch of boats beyond the boarders of a cove and as the dolphins would swim by (as they so often did as part of their routing migratory pattern) the men would bang on the side of their boats with large metal rods creating very loud sounds and vibrations under water. This, of course, scared the dolphins and they would swim inward towards the cove where the fishermen had set up a web of nets thus trapping them. Now how did it go from catching a few prized dolphins for our entertainment at parks to slaughter? Well apparently there was another agenda here. The dolphin meat was being sold as food to those unassumingly purchasing what they though to be various other types of whale meat. How do we know this for sure? The crew set up a mobile lab in their hotel room, went to the market and bought various products marked as whale or other fish and tested them. Guess what they found – some of them were actually dolphin meat. 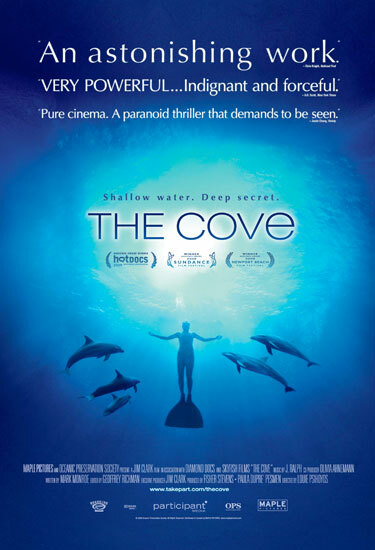 The movie states that the World Health Organization recommends not consuming animals with greater than 0.4ppm mercury. Dolphin meat contains 2000ppm. When Ric asked the fishermen why they were doing this their response was “pest control”. He claims the Japanese government was telling them the dolphins were eating too much of their edible fish supply and therefore they should kill the dolphins. This begins to make more sense when we learn that the mayor of Taiji planned to introduce dolphin meat into school lunch programs across the country. I should also mention here that the group went to Tokyo, Osaka, Kyoto, and other cities across Japan and no one had any idea this was going on. This made me feel a bit better because I LOVE Japan….it just so happens that it has a corrupt town doing horrible things like every other country in the world does. I mean hell, we elected Bush! Now lets talk about the International Whaling Commission (IWC) – the body of people in charge of whaling policy. I wasn’t surprised to find out that like so many other regulatory entities (eh hem USDA) they are corrupted by bureaucracy and under the table negotiations. The similarities between the situation in Taiji between the IWC and whaling and what we face in America between Agribusiness and CAFOs are remarkable. Fish to beef. OK lady. I’m sure your “opinion” is more accurate than reports and the scientific data we have from people who actually know what the F*@% they’re talking about like, say, marine biologists! 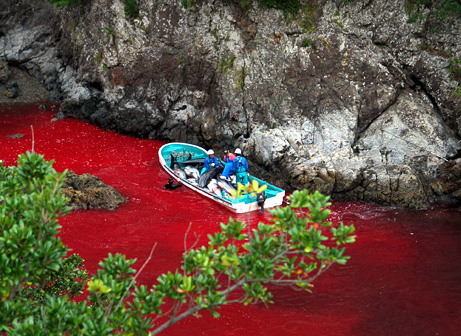 “The Taiji dolphin slaughter is scheduled to resume every September. Entry filed under: Movies. Tags: Richard O'Brien, The Cove, Whaling.